At Lammas (July 31st – August 1st), sometimes called Lughnasadh, it’s time to celebrate the first harvest of the year, and recognize that the hot summer days will soon come to an end. The plants of spring wither and drop seeds to ensure future crops. Grains are ready to be harvested and the fruits are ripe for picking. We can give thanks for the food on our tables. 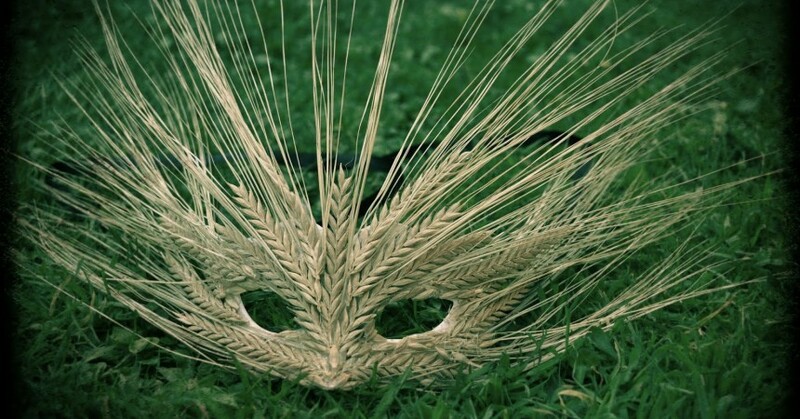 Lughnasadh means the funeral games of Lugh (pronounced Loo), referring to Lugh, the sun god. However, the funeral is not his own, but the funeral games he hosts in honor of his foster-mother Tailte. For that reason, the traditional Tailtean craft fairs and Tailtean marriages (which last for a year and a day) are also celebrated at this time. 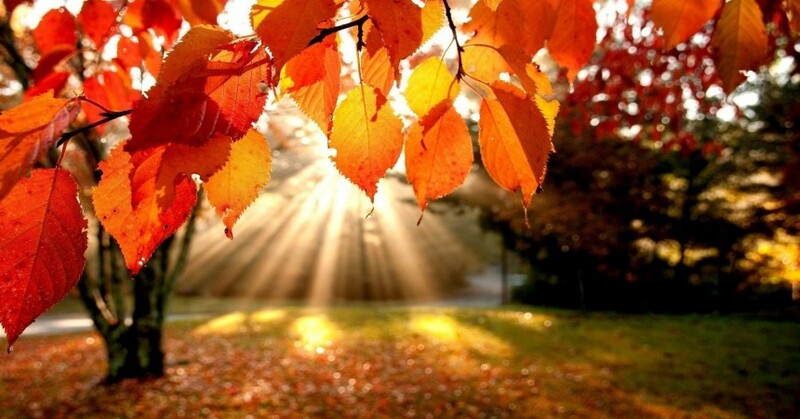 As autumn begins, the Celtic Sun God enters his old age, but is not yet dead. The God symbolically loses some of his strength as the Sun rises farther in the South each day and the nights grow longer. The Christian religion adopted this theme and called it ‘Lammas ‘, meaning ‘loaf-mass ‘, a time when newly baked loaves of bread are placed on the altar. An alternative date around August 5 (Old Lammas), when the sun reaches 15 degrees Leo, is sometimes employed by Covens. Apples, Grains, Breads and Berries. All Grains, Grapes, Heather, Blackberries, Sloe, Crab Apples, Pears. As summer passes, many Pagans celebrate this time to remember its warmth and bounty in a celebrated feast shared with family or Coven members. Save and plant the seeds from the fruits consumed during the feast or ritual. If they sprout, grow the plant or tree with love and as a symbol of your connection with the Lord and Lady. Walk through the fields and orchards or spend time along springs, creeks, rivers, ponds and lakes reflecting on the bounty and love of the Lord and Lady. 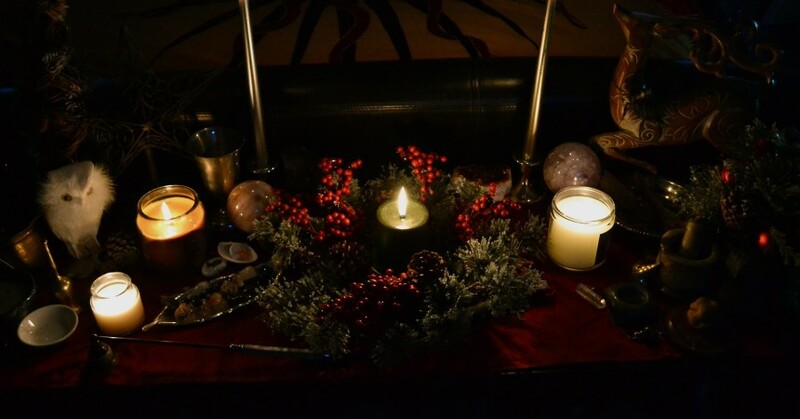 Although the name Litha is not well attested, it may come from Saxon tradition — the opposite of Yule. On this longest day of the year, light and life are abundant. At mid-summer, the Sun God has reached the moment of his greatest strength. Seated on his greenwood throne, he is also lord of the forests, and his face is seen in church architecture peering from countless foliate masks. Midsummer Night’s Eve is also special for adherents of the Faerie faith. The alternative fixed calendar date of June 25 (Old Litha) is sometimes employed by Covens. 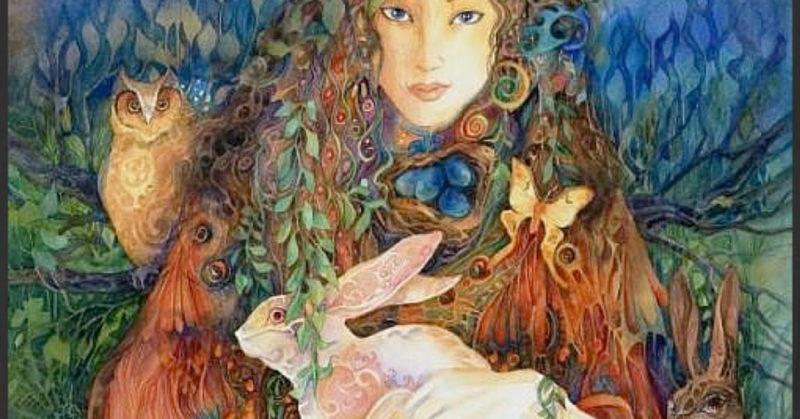 The name Beltane is sometimes incorrectly assigned to this holiday by some modern traditions of Wicca, even though Beltane is the Gaelic word for May. Garden fresh fruits and vegetables are made into a variety of dishes and eaten by Pagan’s who choose to celebrate this day. Mugwort, Vervain, Chamomile, Rose, Honeysuckle, Lily, Oak, Lavender, Ivy, Yarrow, Fern, Elder, Wild Thyme, Daisy, Carnation. Lemon, Myrrh, Pine, Rose, Wisteria. An Ideal time to reaffirm your vows to the Lord and Lady or your dedication to following the old traditions. Beltane has long been celebrated with feasts and rituals. The name means fire of Bel; Belinos being one name for the Sun God, whose coronation feast we now celebrate. As summer begins, weather becomes warmer, and the plant world blossoms, an exuberant mood prevails. In old Celtic traditions it was a time of unabashed sexuality and promiscuity where marriages of a year and a day could be undertaken but it is rarely observed in that manner in modern times. In the old Celtic times, young people would spend the entire night in the woods “A-Maying,” and then dance around the phallic Maypole the next morning. Older married couples were allowed to remove their wedding rings (and the restrictions they imply) for this one night. May morning is a magickal time for wild water (dew, flowing streams, and springs) which is collected and used to bathe in for beauty, or to drink for health. The May pole was a focal point of the old English village rituals. Many people would rise at the first light of dawn to go outdoors and gather flowers and branches to decorate their homes. Women traditionally would braid flowers into their hair. Men and women alike would decorate their bodies. Beltane marks the return of vitality, of passion. 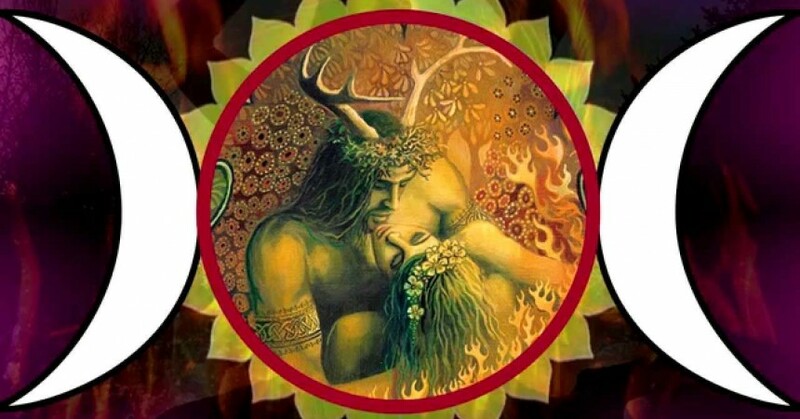 Ancient Pagan traditions say that Beltane marks the emergence of the young God into manhood. Stirred by the energies at work in nature, he desires the Goddess. They fall in love, lie among the grasses and blossoms, and unite. The Goddess becomes pregnant of the God. To celebrate, a wedding feast, for the God and Goddess must be prepared. Let Them guide you! Breads and cereals are popular. Try oatmeal cakes or cookies sweetened with a dab of honey. Dairy foods are again appropriate…just make a lovely wedding feast and you are sure to enjoy yourself! An early morning walk through a local park or forest could be fun for everyone. Gather up some plants or flowers to display in your home. Mom and daughter could braid their hair, and weave in a few tender blossoms. The Christian religion adopted these emblems for Easter which is celebrated on the first Sunday after the first full moon following the vernal equinox. The theme of the conception of the Goddess was adapted as the Feast of the Annunciation, occurring on the alternative fixed calendar date of March 25 Old Lady Day, the earlier date of the equinox. Lady Day may also refer to other goddesses (such as Venus and Aphrodite), many of whom have festivals celebrated at this time. Also known as: Oimelc, Candlemas, St Brigit’s Day. As with all Old Tradition observances, this holiday is usually celebrated beginning at sundown on February 1 and continuing through the day of February 2. 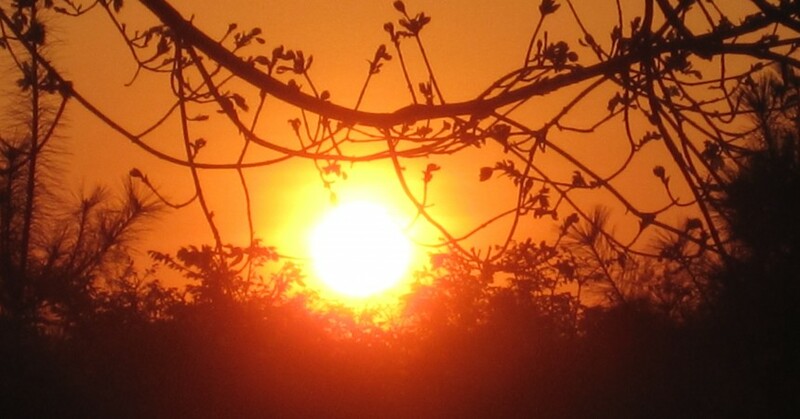 Imbolc means in the belly of the Mother because that is where seeds are beginning to stir as it is Spring. Another name for this holiday is Oimelc, meaning milk of ewes since it is also the traditional lambing season in the old world. Herd animals have either given birth to the first offspring of the year or their wombs are swollen and the milk of life is flowing into their teats and udders. It is the time of Blessing of the seeds and consecration of agricultural tools. It marks the center point of the dark half of the year. This holiday is especially sacred to the Celtic Fire Goddess, Brigit, patron of smithcraft, healing, midwifery, and poetry. It is the festival of the Maiden, for from this day to March 21st, it is her season to prepare for growth and renewal. The Maiden is honored, as the Bride, on this Sabbat. Straw Brideo’gas (corn dollies) are created from oat or wheat straw and placed in baskets with white flower bedding. Young girls then carry the Brideo’gas door to door, and gifts are bestowed upon the image from each household. Afterwards at the traditional feast, the older women make special acorn wands for the dollies to hold, and in the morning the ashes in the hearth are examined to see if the magic wands left marks as a good omen. Brighid’s Crosses are fashioned from wheat stalks and exchanged as symbols of protection and prosperity in the coming year. Home hearth fires are put out and re-lit, and a besom is place by the front door to symbolize sweeping out the old and welcoming the new. Candles are lit and placed in each room of the house to honor the re-birth of the Sun. 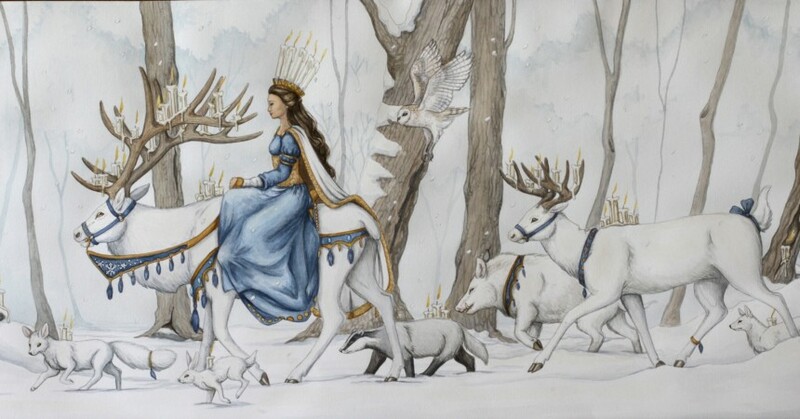 A Covens High Priestess may wear a crown of lights (candles) to symbolize the return of the Goddess to her Maiden aspect, just as the Sun God has reached puberty. Brighid’s snake emerges from the womb of the Earth Mother to test the weather, (the origin of Ground Hog Day), and in many places the first Crocus flowers began to spring forth from the frozen earth. The Christian religion adopted a number of these themes, as follows: February 1 became St. Brigit’s Day, and February 2 became Candlemas, the day to make and bless candles for the liturgical year. The ‘Feast of the Purification of the Blessed Virgin Mary ‘ adapts the Maiden Goddess theme. The alternative date of February 14 Old Candlemas, Christianized as Valentine’s Day is employed by some Covens. Purity, Growth and Re-Newal, The Re-Union of the Goddess and the God, Fertility, and dispensing of the old and making way for the new. Brideo’gas, Besoms, White Flowers, Candle Wheels, Brighid’s Crosses, Priapic Wands (acorn-tipped), and Ploughs. Basil, Bay, Wisteria, Cinnamon, Violet, Vanilla, Myrrh. Candle Lighting (light Candles or lamps in each room of the house right after sunset for a few minutes to honor the Sun’s rebirth), Stone Gatherings, Snow Hiking and Searching for Signs of Spring, Making of Brideo’gas and Bride’s Beds, Making Priapic Wands, Decorating Ploughs, Feasting, and Bon Fires maybe lit.